The immediate area around Rocklin, California, wasn’t rich with gold. However, many gold miners traveled through the Rocklin area to reach the gold mines east of Sacramento. During the Gold Rush years of 1849 and 1850, Rocklin became a profitable way-stop for early traders looking to sell goods and services to prospectors. By the time the Gold Rush had slowed down, men in the region were looking for a new business venture. In 1860, one local entrepreneur named Mr. Hathaway decided to open a quarry. Hathaway realized that granite blocks were going to be needed to build the California State Capitol in Sacramento. He also knew that there were large granite boulders lying above ground all around Rocklin. In fact, Rocklin was built on one massive granite slab. Mr. Hathaway built his first quarry next to a place many Rocklin residents are still familiar with today. The first quarry lay next to the large outcropping of granite you can still see today along the west side of Pacific Street (specifically, at the intersection with Ruhkala Road). Granite from this quarry made up some of the base layers of the California State Capitol in Sacramento. Prior to Mr. Hathaway’s capitol construction plan, the earliest reporting of granite quarrying in Rocklin took place in 1855, when an order of granite was shipped from Rocklin to Fort Mason in San Francisco. If you’ve been paying attention, then you may have already guessed where the name “Rocklin” comes from. The land around modern Rockland was filled with granite boulders. People in the region decided to call it “Rock Land” due to the extensive rock outcroppings and large quarrying activities. Over time, many believe this name was “corrupted” to Rocklin – possibly by Finnish immigrants (Rocklin translates to “Rockland” in Finnish). In 1864, Rocklin became a little closer to the rest of the world when the Central Pacific Railroad arrived in town. This gave residents and businesspeople an immediate link with the outside world. Predictably enough, Rocklin’s first railway shipment was an order of granite. Railway transit gave local quarries an opportunity to bring their granite to market more easily. 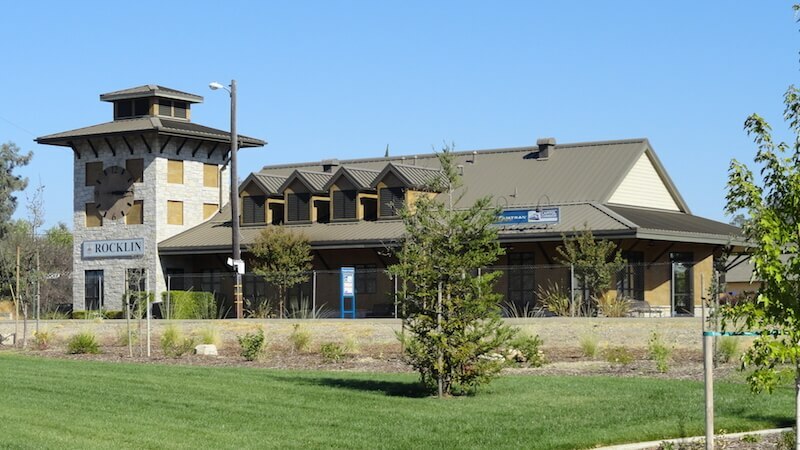 A burgeoning economy expedited the growth of Rocklin over the next few decades. By the turn of the century, the entire west side of Front Street or 1st Street was a solid row of business buildings. The town was also home to a Masonic Lodge, a Temperance Society, a butcher shop, an icehouse, and many other businesses. Between 1890 and 1910, the town’s population held steady at around 1,000 people. 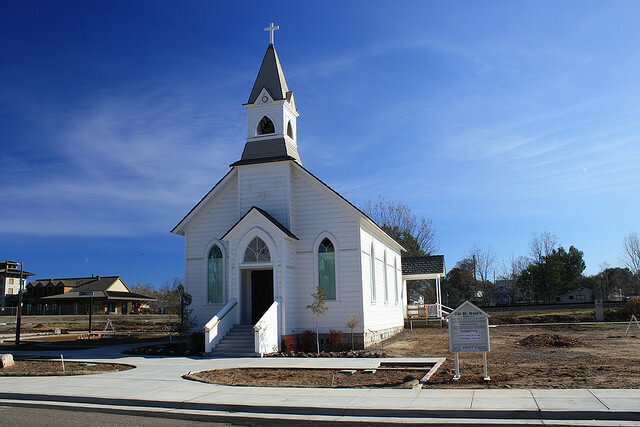 Between 1900 and 1920, Rocklin started a long and slow decline in population and economic activity. Many residents moved north to Roseville, which was close enough to avoid changing jobs but far enough that it was closer to the junction of the Oregon line. Homes in Rocklin soon became so worthless that residents burned their homes just to collect the insurance money. The population dropped substantially. In 1920, Rocklin hit a historically low population of 643. In the 1920s, numerous quarries closed due to lack of business as well as a stonecutter’s strike. By 1928, only seven quarries remained. The train stopped visiting Rocklin in 1932. By 1938, the railroad depot was used so infrequently that the railroad depot was torn down. Granite mining officially ended in Rocklin in 2004. As of the 2010 census, Rocklin was home to 56,974 (estimated 60,344 in 2014). The economy is more diversified today, with companies like SMA Solar Technology AG manufacturing solar inverters in the region. Fuller Moving Services can help you move to or from Rocklin–wherever you need to go. With a nationwide network of resources available, Fuller Moving Services is your local company with global connections.